At work recently, we wiped a Fedora development server and reinstalled with the newer version of the OS. When everything was back up and running, I tried to connect to it through SSH. 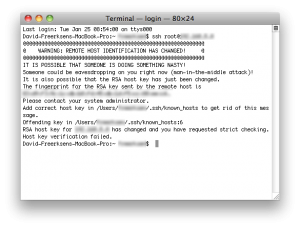 I got an error I hadn’t seen before about my RSA host key is wrong. Where YOUR_USERNAME is your login name for your Mac. If you don’t what what it is, your login name is the word right before the $ in the Terminal window. That’s it. Your done. You can now go through SSH again. A new RSA key will be generated for you automatically. All this really did was delete a file named known_hosts inside the hidden /Users/YOUR_USERNAME/.ssh directory. Since it deleted the file, this also means that RSA keys for other SSH connections will be lost as well. 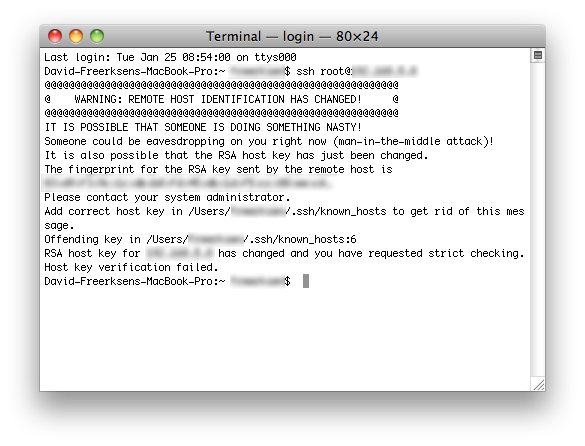 However the next time you SSH to them, you will be given a new key automatically. If you ssh to a lot of servers running rm on the known_hosts file will mean you have to accept the hosts key on all your servers again. I cant thank you enough for this quick fix tried to sift through some other people’s descriptions and really confusing. Awesome! Been learning Linux and Mac and this was a huge help! Thank you thank you thank you!! This was driving me crazy after a server rebuild and I couldn’t connect to any of my stored SFTP accounts in my editor program.